After delivering over 3,200 Kilograms of cargo to the International Space Station, the Cygnus S.S. Gene Cernan departed the orbiting complex on Wednesday to close out a three-week stay and 24 hours of detailed radio interference testing to aid future crew vehicles arriving and departing the orbiting laboratory. Being released at 13:11 UTC, Cygnus is now set to maneuver to an independent orbit for the release of a record number of 14 CubeSats completing a variety of operational and demonstration missions. 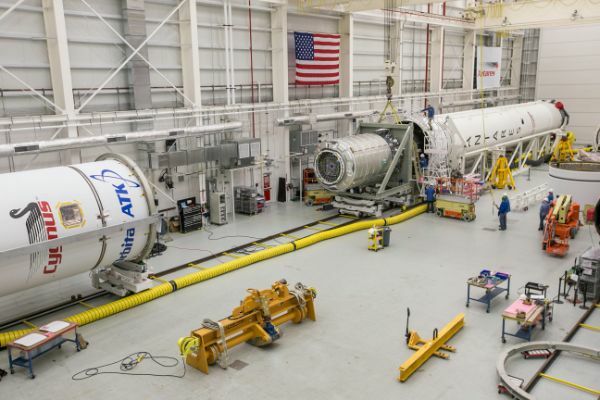 Cygnus arrived at the Space Station on November 14 after a very smooth rendezvous process, enabled by the flawless performance of the second Antares 200 series launch vehicle that provided the craft with a perfect orbital insertion. 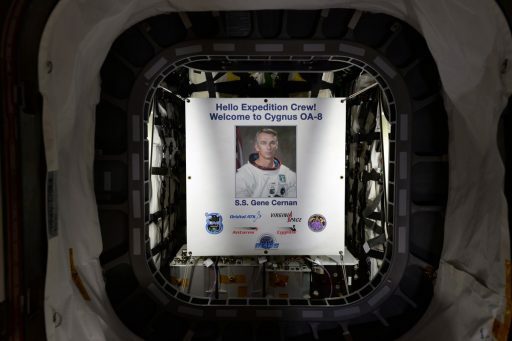 Bolted into position on the Earth-facing port of the Station’s Unity Module, Cygnus was opened for business later on November 14th and the Space Station crew was greeted by a commemorative poster of the late Moonwalker whose name this Cygnus is carrying. 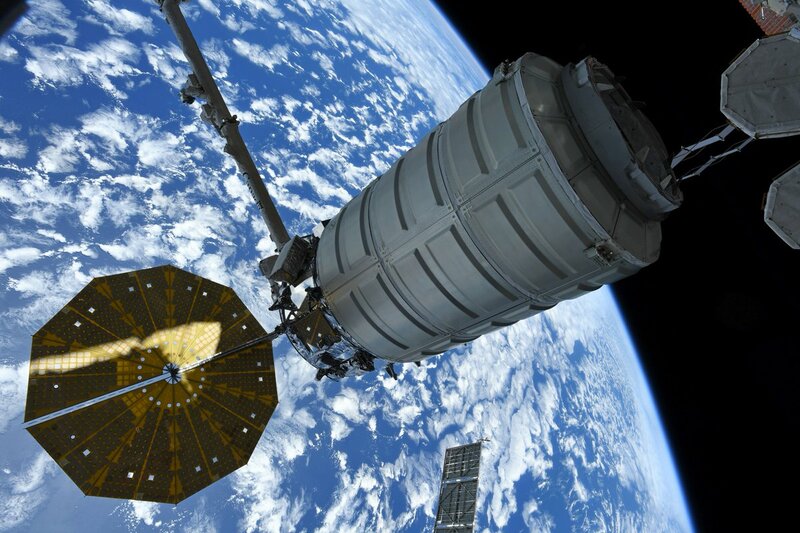 After three science-heavy Dragon missions arriving at ISS this year, Cygnus OA-8 was more focused on the supplies side, allowing ISS to extend its consumables to June 2018. Packed into the Italian-built cargo module were 3,229 Kilograms of cargo comprised of 1,240kg of crew supplies including food provisions and clothing, 851kg of maintenance gear and systems hardware to keep ISS in operational form, 740kg of science investigations and CubeSats, and 166kg of spacewalk equipment and computer resources. Two CubeSats delivered aboard the Cygnus spacecraft were released from the Space Station on November 20/21 with three satellites from a previous delivery to begin a diverse set of missions studying how the antibiotic resistance of E. coli changes in space, testing out a new ultra-small space telescope design for exoplanet science, demonstrating a 6U CubeSat platform for science-class missions, studying ionospheric stimulation, and evaluating a drag device for removing satellites from orbit. Cygnus OA-8 also participated in a demonstration of the “extended lab” concept wherein visiting vehicles can be used as an extension of ISS laboratory volume while attached. This involved moving the Space Tango TangoLab-1 module from Express Rack 4 into the Cygnus cargo vehicle for a week-long demonstration before being moved back to the ISS side. The TangoLab is a reconfigurable general research facility providing a plug-and-play architecture for standardized science modules with around 2 CubeSat units of volume for experiments in a number of fields including biology, biochemistry and physics. With only a three-week docked mission, the four USOS crew members had their hands full to get the 3,229kg of cargo moved to ISS and replace it with 2.8 metric tons of trash and no-longer-needed hardware for disposal when Cygnus meets its fiery end over the Pacific Ocean. 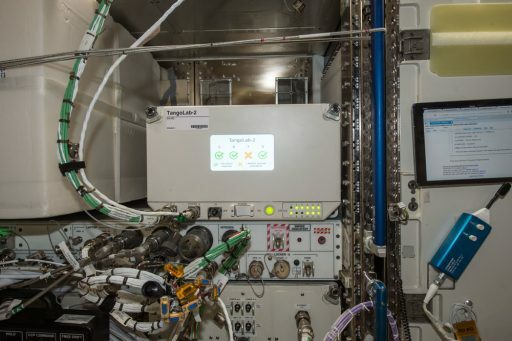 Hardware delivered by Cygnus included replacement gas bottles for the Combustion Integrated Rack for upcoming research into combustion dynamics in microgravity, a Rodent Habitat to provide a home for the next Rodent Research mission flying on SpaceX, and parts for the Station’s 3D printer. Approaching the end of its stay at ISS, the S.S. Gene Cernan was buttoned up by the crew – going through the usual procedure of closing out the interior of the spacecraft before closing its hatch, then outfitting the vestibule between ISS and Cygnus with bolt drive assemblies and removing power and data connectors before closing the Unity module hatch to permit the standard leak check to be performed. 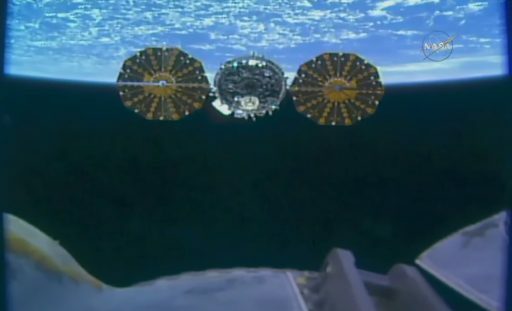 Sixteen bolts were released to free the Cygnus spacecraft from Unity and transfer control over to Canadarm2 that had grappled the spacecraft on November 30. Unberthing was marked at 17:52 UTC on Tuesday and Canadarm2 was put through a series of maneuvers to swing the 6.4-meter long spacecraft around and position it above the Station’s Harmony module. Hanging out above Harmony, Cygnus conducted radio interference and GPS checks to verify future crew vehicles will be able to have stable communications and GPS position calculation as they approach the zenith docking port on Harmony, to be established with the installation of International Docking Adapter 3 on Pressurized Mating Adapter 3 that had been moved to this location earlier in 2017. Cygnus was the perfect vehicle to conduct this test due to its ability to receive power and communicate through its Power & Video Grapple Fixture, allowing the spacecraft to remain attached to Canadarm2 for extended periods. After the completion of the overnight checks, Cygnus was maneuvered to park below the Harmony module where it awaited its release. Taking up station inside the Cupola, NASA Astronauts Mark Vande Hei and Joe Acaba began setting up the Robotics Workstation for release of the Cygnus spacecraft. 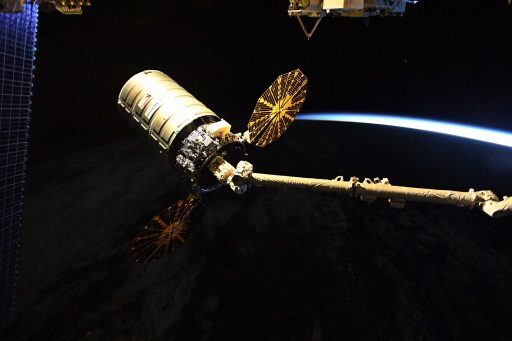 When the optimal release time arrived based on lighting conditions and orbital dynamics, the command was issued to release Cygnus by retracting latches and opening snares within the arm’s Latching End Effector. 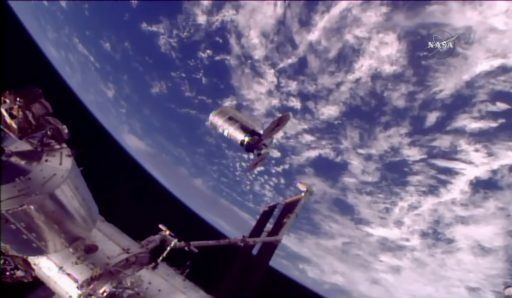 Release was marked at 13:11 UTC on Wednesday and Canadarm2 backed away from Cygnus before the spacecraft was allowed to recover from Free Drift and gently fire its thrusters for a posigrade departure maneuver – pulling out in front of ISS. Twenty minutes after release, Cygnus departed the ISS Approach Ellipsoid, ending integrated operations between NASA’s Mission Control Center in Houston and Orbital MCC in Dulles, Virginia. 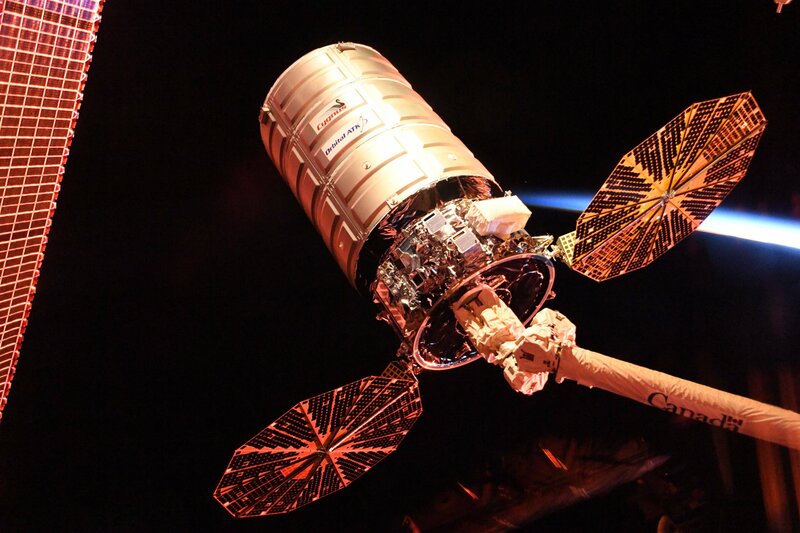 Later in the day, Cygnus will conduct a pair of orbit-raising maneuvers to enter an orbit around 450 Kilometers in altitude, some 50km above the Space Station’s orbit. This will provide the CubeSats released from Cygnus with a longer orbital lifetime compared to release from the Space Station which typically leads to re-entry within a year of deployment. Packed into the NanoRacks CubeSat Deployers affixed to Cygnus are eight Lemur-2 satellites operated by Spire Global to collect global ship-tracking data and atmospheric pressure & temperature profiles; two OCSD satellites testing high-speed laser communications and a new CubeSat propulsion system, PropCube 2 looking into artificial ionospheric stimulation to influence radio communications; the Asgardia 1 satellite of the self-proclaimed space nation; the ISARA CubeSat for a test of a high-speed Ka-Band communications antenna; and the Naval Research Lab’s CHEFsat preparing consumer communications technology for use in space. 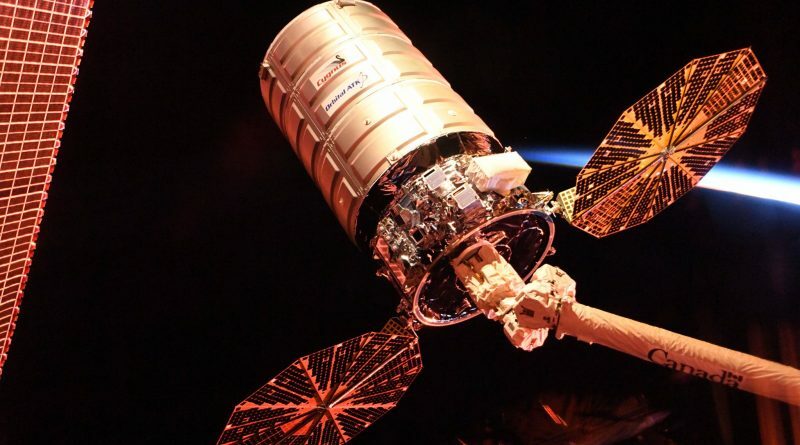 Cygnus OA-8 will remain in orbit through December 18 when the spacecraft will complete a pair of retrograde maneuvers to set up a targeted, destructive re-entry over the Pacific Ocean to close out the eighth operational Cygnus mission. 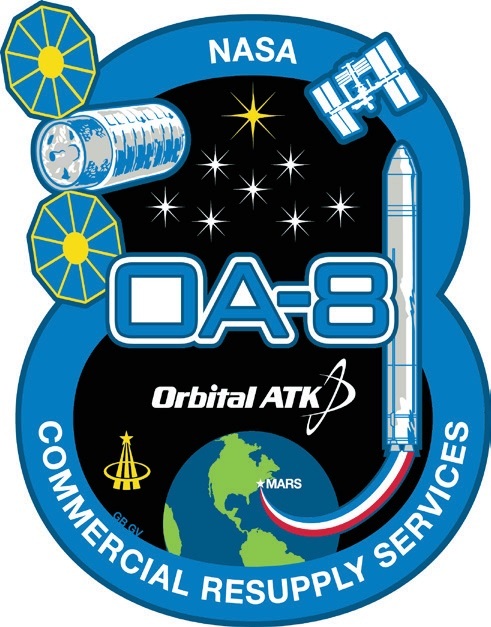 Copyright © 2019 Cygnus OA-8 | Spaceflight101. All rights reserved.